Sustainable Marine Energy (SME) has successfully installed four subsea rock anchors in the challenging tidal flows of the Fall of Warness at EMEC. In what is believed to be a world first Sustainable Marine Energy (SME) has successfully completed installation of four subsea drilled rock anchors at its berth at the European Marine Energy Centre (EMEC). The anchors will be used to moor its PLAT-O tidal energy platform. The Anchoring Remotely Operated Vehicle (AROV) which was used for the installation has been developed in-house at SME over the past three years. Marine operations were performed from Leask Marine’s multicat C-Salvor. “We would like to acknowledge all of the support we have had throughout the delivery of our anchor project. It has extended all the way from the Department of Energy and Climate Change (DECC) and Innovate UK down to our development partners Rockbit UK Ltd and Leask Marine who have gone out of their way to make everything possible. The AROV first saw action in the Solent in 2014 installing helical screw piles into the clay seabed to moor PLAT-O for its initial Yarmouth trials. 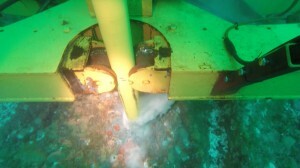 Since then the company has tackled two streams of technology development; development of an expanding rock anchor that requires no grout for installation, and integrating the required technology in the AROV package to enable remote installation at 30+m of water depth in an extreme tidal environment. The 3.5m length anchors have a nominal holding capacity of 100t dependent on the type of the rock. Building off this success SME is now working to develop a range of anchors with even greater holding capacity and suitable for a range of substrates. “This is a very exciting time for SME” said David Stoddart-Scott, Head of Project Development.